I have another quilt finished. It’s an issue quilt too. This is it when it was on the machine. Don’t get me wrong; I love getting these quilts. These quilts are my bread and butter so to speak. The issues don’t bother me at all because I can quilt them very quickly and move on to the next top. Still…. there are times when I have to wonder….. what were they thinking? Why do the toppers feel the need to include that much extra fabric instead of measuring and cutting to match? 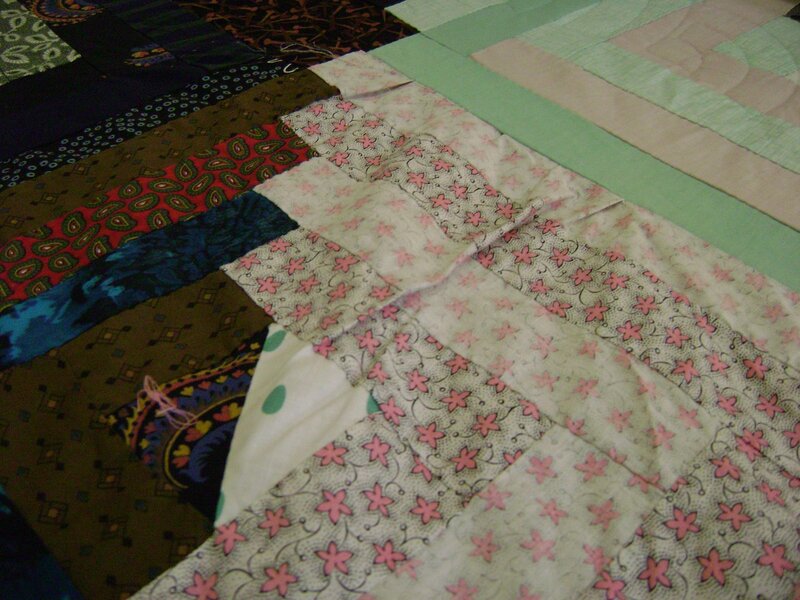 Is there a nationwide shortage of fabric I don’t know about and people want to hoard it in their quilt? Who is teaching these toppers? Do the toppers own an iron? I know of some machine quilters who would refuse to quilt a top like this. They would tell the topper to take it home and fix it first. I know of other machine quilters who would feel the need to take it apart themself and fix it. My thoughts are…. and I’ve said this for many, many years….. Your quilt will be quilted in the condition it is in when you bring it to me. 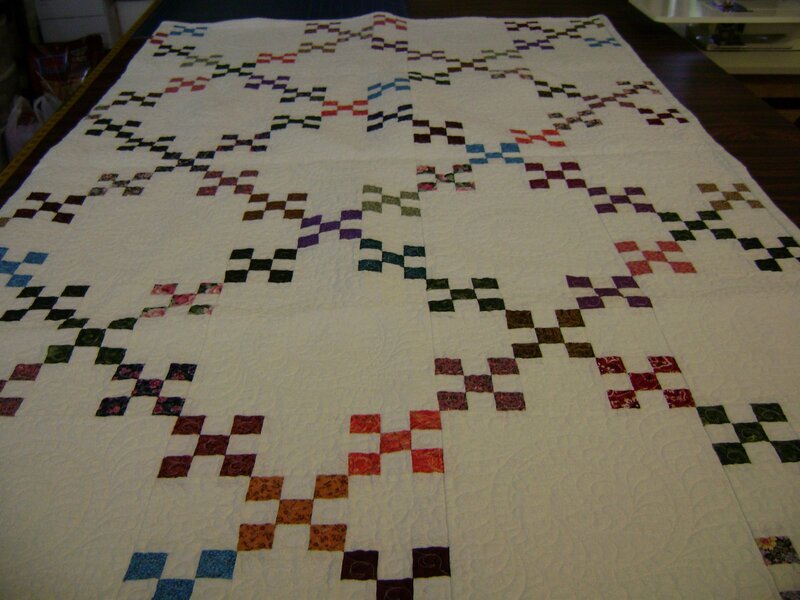 So here is this one all quilted. I do love the Circle Lord for quilting these tops. It’s reasonably flat and even just waiting for me to wrap the back over the top for a binding. 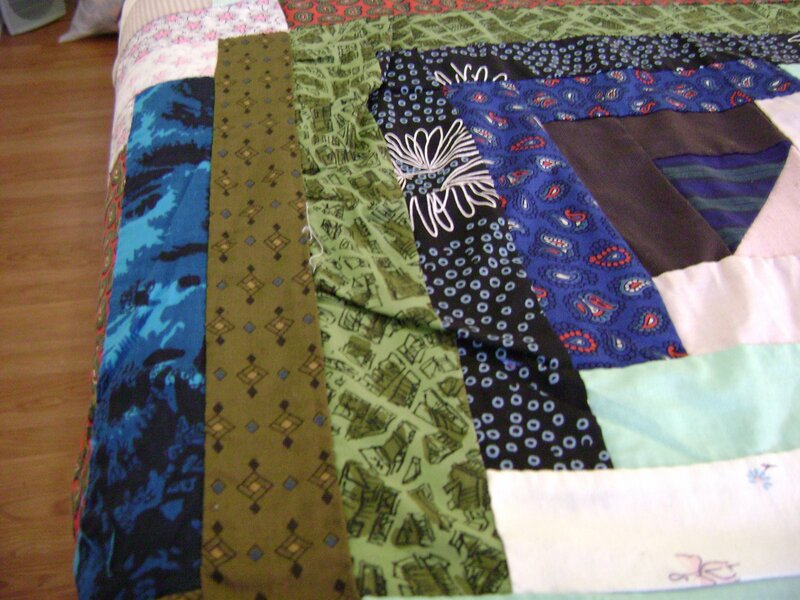 Yup, I did quilt in a few tucks here and there. Someone will love it and treasure it…. issues and all. I try to give each topper a new tip on improving their work. 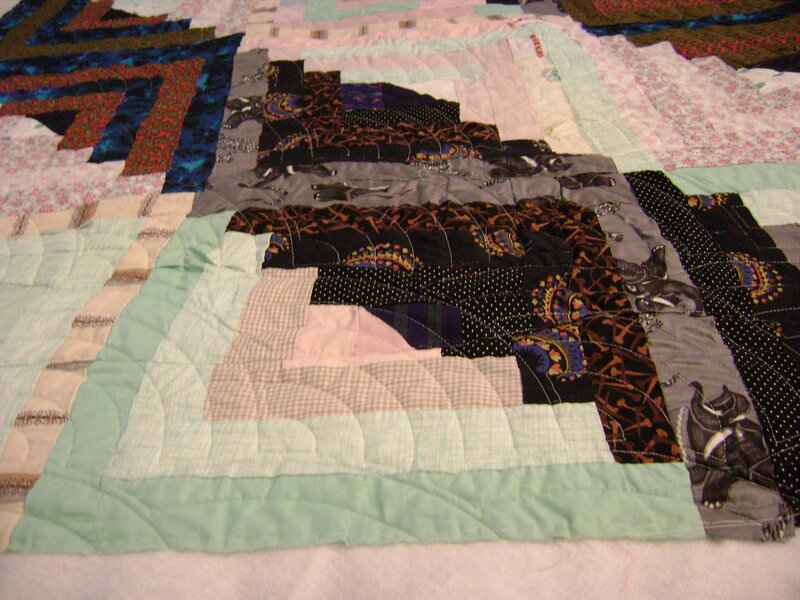 For some, one issue quilt will be the only top they ever make. For others, they continue to make tops and improve with each one. This next quilt is by such a person. A few years ago she brought me her first top. Oooo eeee, did it have plenty of issues. But just look at how she does now. Not perfect but very much improved! I feel like a proud moma at a kid’s graduation to see the work she’s doing now. Her tops have graduated to semi-custom. 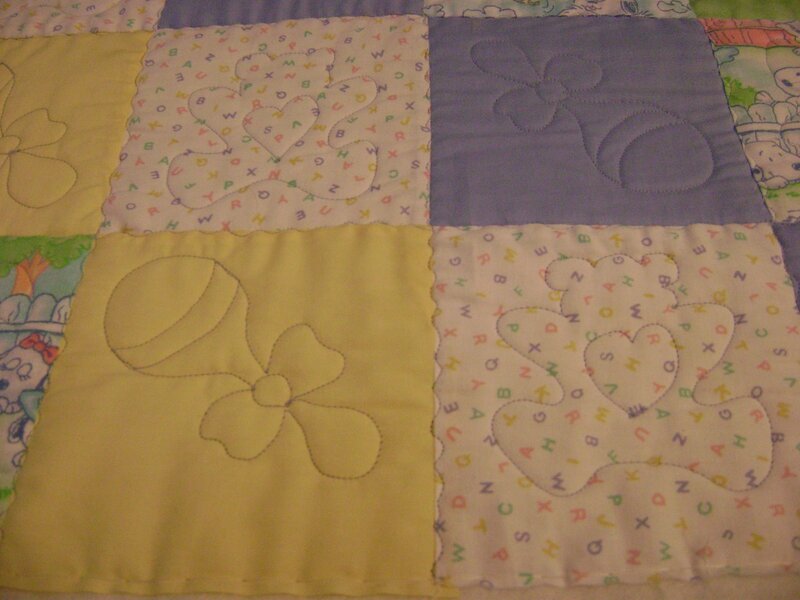 This is for a grandchild so I did baby rattles and love bears on it. Remember this quilt from a few months ago? 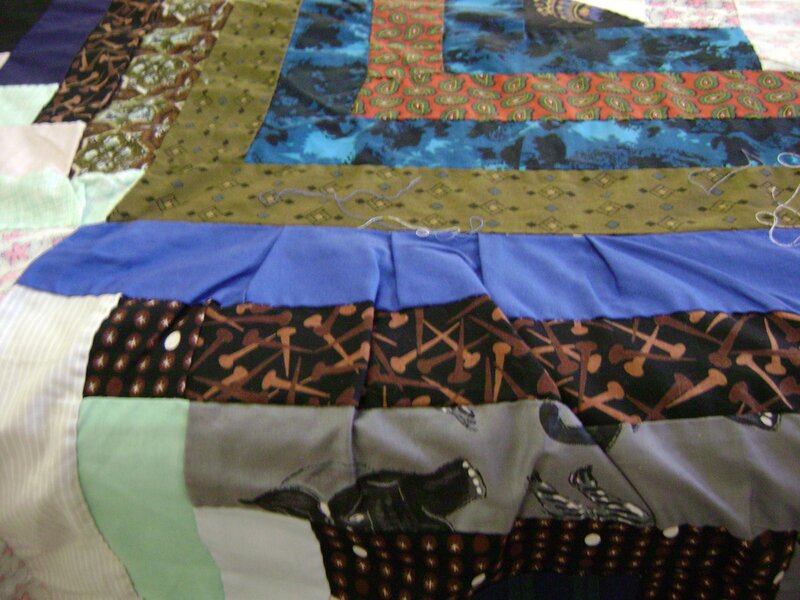 It’s a charity quilt that’s been waiting for a new home. I had planned to send it to a family that lost their home in a fire. 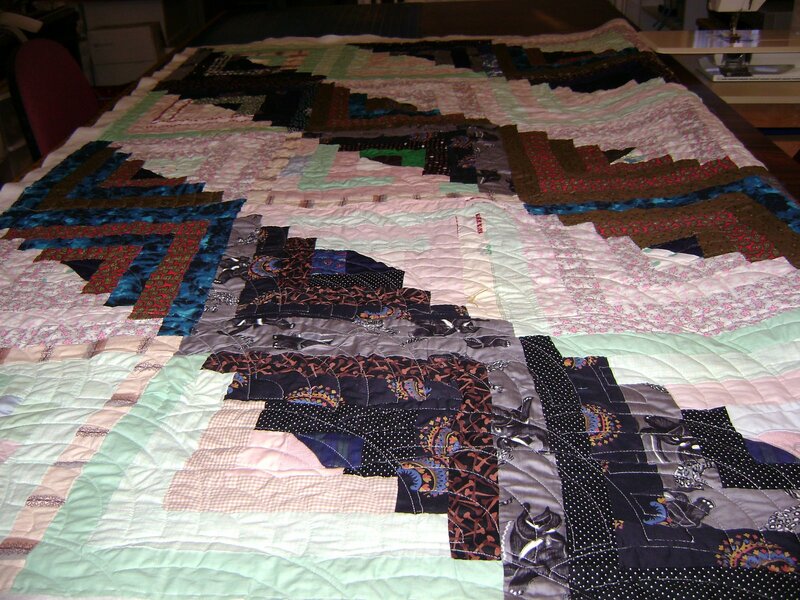 By the time I finally got it quilted I had forgotten who the family was or where to send it. That’s what happens when I don’t have finished charity quilts waiting to be sent out as I see a need. Circumstances have prevented me from making charity tops for several months. I’m making plans to change that this coming year! I have a bunch of ufos and pigs just waiting on me. Yesterday, I had a very good customer call me to ask… if she could make a top very quickly, how long would it take me to quilt it? When I asked why she needed one finished so urgently; she said it was for a cancer patient who always felt cold during treatments. Well heavens, it is the xmas season. I get urgent calls like this every year about this time. I had to explain that I’m booked for the rest of the year with xmas quilts. I really wanted to say I could quilt one for her; but, it would be unfair to my other customers who have waited months for me to get to their name on my waiting list. What I suggested to the customer was that she go ahead and make a top and trade it for the one I already had completed. We both win in this situation. She gets what she needs and I get another top to be done for another charity in the future. I don’t feel so bad about saying no to a good customer nor do I rush myself to squeeze another top into an already full schedule. Today is guild meeting. We are meeting today since the last meeting was cancelled due to Ike. I won’t be getting any customer quilting done today. 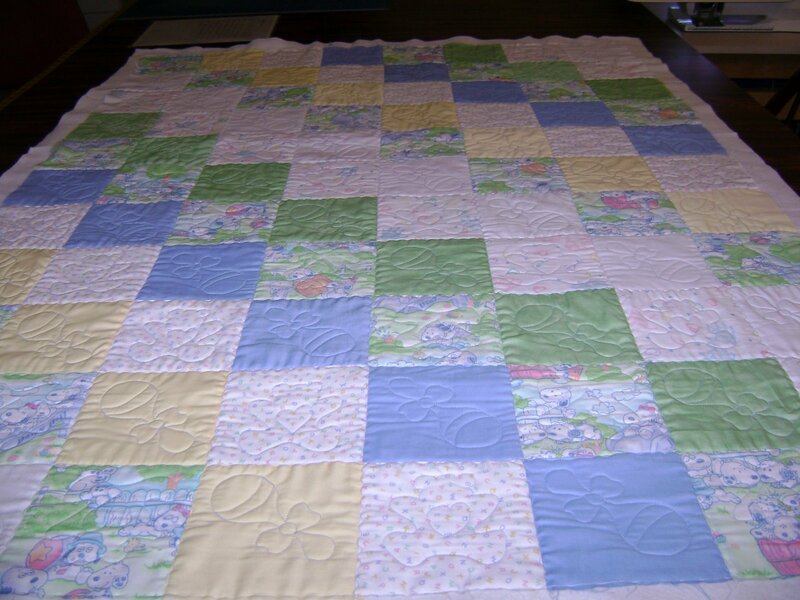 This entry was posted on September 28, 2008 by Anita in QUILTS - CHARITY, QUILTS - CUSTOMER.